Photo: Mueller-Wright House, ca. 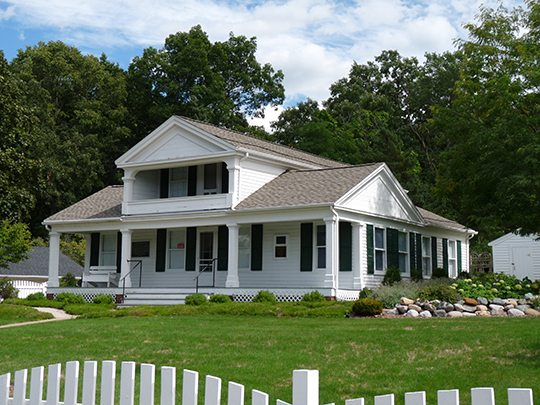 1840s, 431 Washington Street, Wrightstown, WI. Listed on the National Register of Historic Places in 1978. Photographed by User:Jeff the quiet (own work), 2012, [cc0-by-1.0 (creativecommons.org/publicdomain/zero/1.0/deed.en], via Wikimedia Commons, accessed January, 2014. Brown County administrative offices are located at 305 East Walnut Street, Green Bay, WI 54301; phone: 920-448-4035. Brown County was organized October 26, 1818. Brown County once embraced half the area of what is now Wisconsin, but was gradually lopped off in every direction, 22 new counties having been formed from it's original territory. The area was subject to many jurisdictions, but always the land lying between De Pere and Green Bay formed its center and capital. It was an important post under the old French Regime from 1669-1759 — it then came under British rule and remained practically a British colony until after the War of 1812. The county is named for Major-General Jacob Brown who made his reputation in the War of 1812, becoming General-in-Chief of U.S. forces in 1821. The fur trade which dominated the area for 2 centuries began with the coming of the first Frenchman and continued uninterrupted until there were no fur-bearing animals of any value left. The era is defined as beginning with the coming of Jean Nicolet in 1634 and ending in 1844 when the American Fur Company of Green Bay closed its business. Deborah B. Martin, History of Brown County Wisconsin Past and Present, Volume I, S.J. Clarke Publishing Company, 1913.